When he coined (or just popularized) the term “CWs” in 2010, Brazilian Finance Minister Guido Mantega was implying it was a negative sum game. The expansionary monetary policies in the US would not have much effect locally but would create havoc in emerging markets in general and in Brazil in particular. But no matter the measures taken, Brazilian competitiveness only deteriorates. An example: Since 2007 the number of exporting firms has dropped from 20.9 thousand to 18.6 thousand and the number of new entrants into the export market is the lowest among 15 selected countries. Coup de grace: An exporter not only lost an export contract to a British client but later saw his former customer export to Brazil at a price significantly lower than his own! The government is continuously worried about propping demand to sustain growth, but Brazil´s main problem lies elsewhere. The big constraint is supply. In 2011 growth was only 2.7% and in 2012 it is expected to have been a measly 1%. 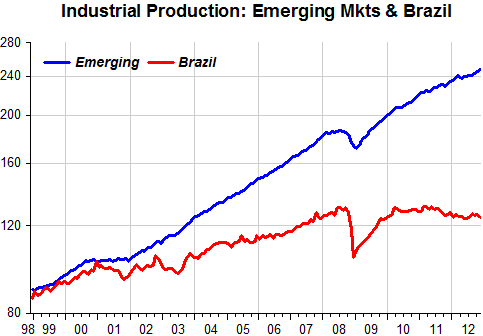 The charts are a good indication of supply constraints in Brazil. 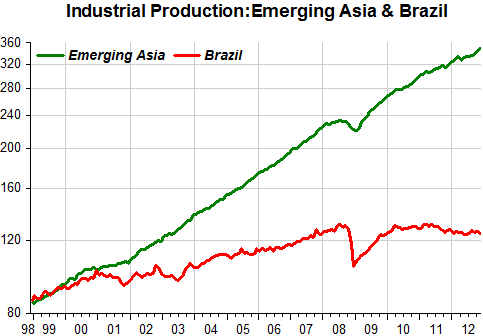 I compare industrial production in Brazil with emerging markets production and with production in Asian emerging markets. 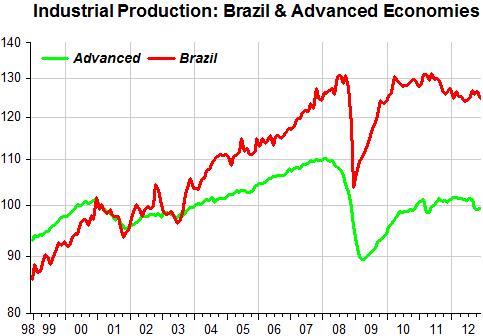 Just to get a sense of the lackluster dynamics I also compare Brazil´s production with production in the advanced economies. Note that since the “currency wars” began, Brazil´s industrial performance has managed to be even worse than that in the advanced (and ‘sick’) economies! In short, ‘something’ has really been ‘restraining’ Brazil´s growth and it sure isn´t economic policy in advanced economies. That´s just a convenient excuse. 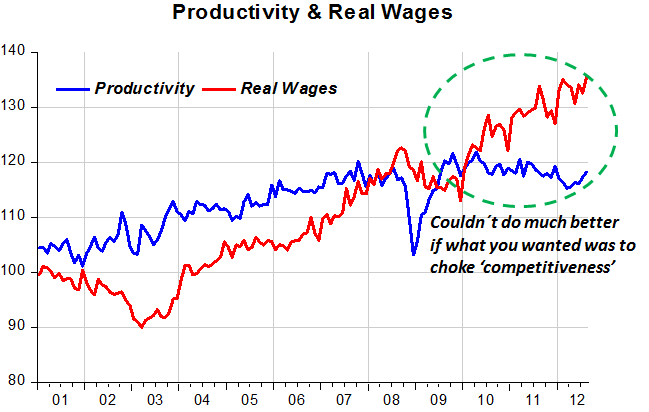 Update: Take a look at how real wages and productivity have evolved! Currency wars are really the monetary equivalent of burning down one’s house in order to stay warm.